Fill out our simple form and get quotes from local bands and DJs. Create the life and soul of your event and hire a band or DJ to bring the atmosphere and energy to your party that will really make it memorable. All genres of DJ hire, wedding band hire and bands for parties can be found here, so get the party started and request a free quote today. We supply a fantastic visual video DJ service as well as a normal DJ service to clients across West and Central Scotland. We have very competitive prices for all types of events. Professional DJ Service for Weddings, Parties and Celebrations. 70s and 80s Disco theme nights. Music and disco lights from the 70s and 80s. I have been DJing since 1974 and I've genuine 70s and 80s equipment and music to make your theme night a great success. No matter what your music taste is, there’ll be a band out there that can help to make a special event even more meaningful and unforgettable by performing to your party guests. Wedding band hire or DJ hire is a must for your big day to ensure there’s plenty of dodgy moves and Dad dancing! Mini festivals need support bands, corporate events can be enhanced by a performer closing the evening, and how about an intimate performance by a singer or quartet for a special anniversary meal? There are musicians, DJs and bands for hire all across the UK who can serenade you with your favourite song or blast out your best-loved beats. 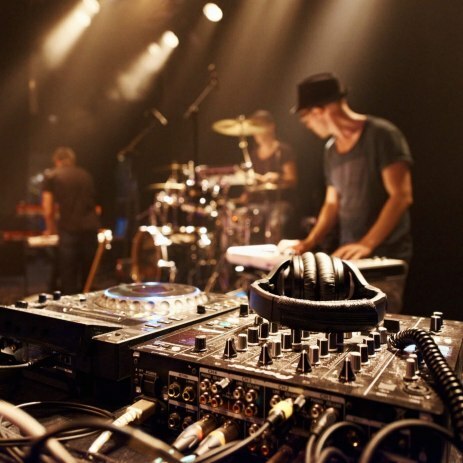 Take a look at the options here, and request free quotes from DJs and bands in your area.